Situated atop the Mountains of Rizal at approximately 200 meters above sea level, a golf club can afford to give its players the breath-taking views of Laguna de Bay and the skylines of Ortigas and Makati City. The Eastridge Golf Club. 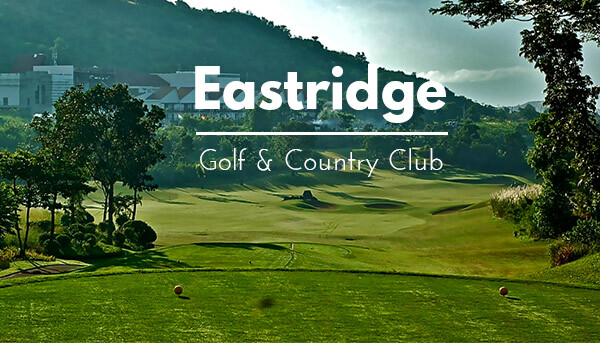 The Eastridge Golf Club can give its members the experience of playing golf high-up in the mountains with a thrill. Eastridge also offers the beautiful scenery that can only be seen in a few places. The course was developed in the midst of mountain ranges, and so the developers carved the fairways and the greens out of the mountain ridges and rock formations. Despite of the meticulous development of the club, the course must not only be playable but it must also adhere to the international standards of a championship golf course. The design of the golf course was brought by the architectural expertise of James Martell, Jr. a renowned golf designer. While designing the course, Martell wanted to preserve as many of the natural attractions intact, and create as many vantage points, where players and visitors can view scenic spots. 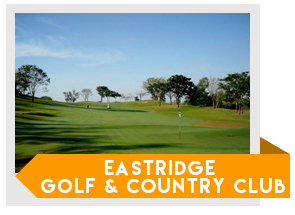 The 18-hole par 72 championship course of the Eastridge Golf Club is an all-weather golf course. Players can play golf anytime whether it’s rain or shine. When there is a heavy rain, the players may wait for the rain to stop and continue playing after the rain without worrying about flooding on the fairways. The natural formation of the mountain slopes and the sand underneath the tifeagle grass creates a natural drainage for the course. The rainwater gets contained in a buffer and is used to water the grass when it is dry, to maintain the quality of the course. There are various facilities in the golf club that provides the further needs of the players, such as the driving range, three practice putting greens, tee houses on the fairway, pro-shop, a modern clubhouse with a cocktail lounge, dining, function and board rooms, showers, sauna, massage and locker room facilities for male &female, swimming pool which can accommodate up to 50 people. The club is 17 kilometres away from the EDSA-Ortigas intersection and 24 kilometres away from Cubao.